Yesterday I listened to a discussion about former Haitian President Jean-Betrand Aristide’s plans to return to Haiti after a seven-year exile in South Africa on NPR’s Tell Me More. Tell Me More host Michel Martin and Jacqueline Charles, the Caribbean correspondent for the Miami Herald, engaged in a lively discussion about the impact of Aristide’s return on Haiti’s presidential run-off election on March 20. Click here to listen to the show. Former First Lady Mirlande Manigat and pop singer Michel “Sweet Micky” Martelly are the presidential candidates. 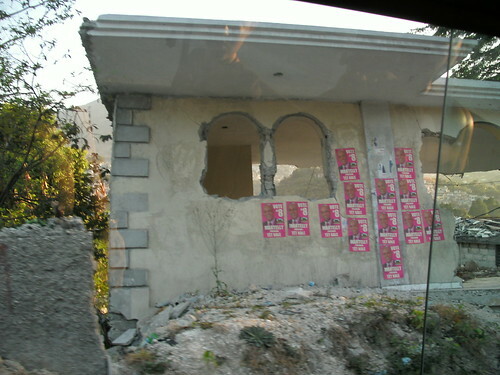 Martin and Charles’ discussion reminded me of the many presidential candidate posters I saw on houses and buildings during my recent trip to Haiti as a Heart of Haiti blogger ambassador in February. Sweet Micky”s posters appeared to dominate Port-au-Prince, Croix-des-Bouqets, and Jacmel. No matter who wins the election, I hope and pray Haiti’s next president will help stabilize, heal, and rebuild Haiti and the lives, families, and businesses of her daughters and sons. Well said! Haiti needs stability and a peaceful transition of power to continue its recovery. Having just returned from Haiti with PeaceQuilts, we were pleased to see more progress in the cleanup efforts and some additional new construction since our previous visit in November. Thanks Jean. I enjoyed visiting PeaceQuilts when I was in Haiti. The ladies are powerful creative women! Loved the nuns!